Impressive set of nine eyeglasses owned and worn by nine U.S. Presidents, with many accompanied by signed photos and letters from the Presidents. 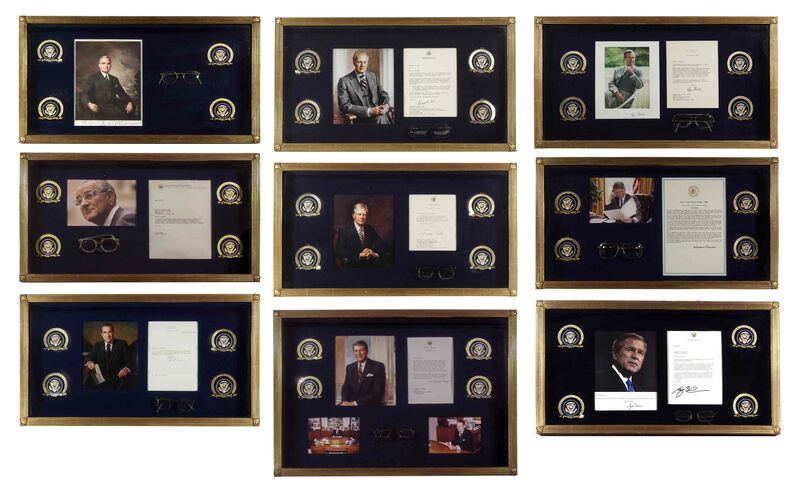 Set includes eyeglasses worn by nearly every post-WWII President, including: Harry S. Truman, Lyndon B. Johnson, Richard Nixon, Gerald Ford, Jimmy Carter, Ronald Reagan, George H.W. Bush, Bill Clinton and George W. Bush, all gifted to the Museum of Ophthalmology, and each framed in its own presentation shadowbox. 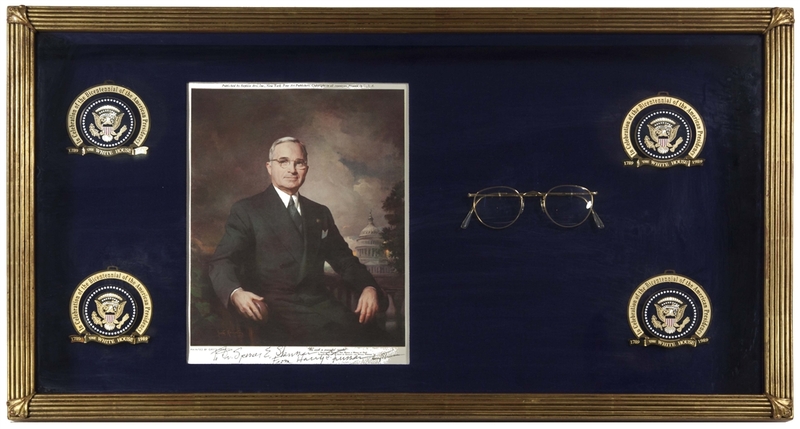 Set comprises (1) Harry S. Truman's iconic round eyeglasses, worn by the 33rd President and gifted to Dr. Spencer Sherman, to whom Truman inscribes the photo framed with the glasses: ''To Dr. Spencer E. Sherman / From Harry S. Truman''. Truman famously wore eyeglasses his entire life following an early childhood bout with diphtheria that led him to reading and academics. While Truman's eyesight inhibited him from joining a military academy as a young man, he would later serve in the trenches during World War I. Eyeglasses with brass-finish frame measure 5.5'' from endpiece to endpiece, with the trademark round lenses, slightly peaked bridge, and transparent temple tips and nose pads. Shadowbox frame measures 29.5'' x 16.5'' x 2.875'' deep. Presentation is near fine. (2) Pair of Victory 6 U.S.A. bifocal eyeglasses owned and worn by 36th President Lyndon B. Johnson who, incidentally, was the first President to wear contact lenses. Green translucent plastic eyeglasses measure 5.25'' wide from endpiece to endpiece, with maker's name visible on both temples. 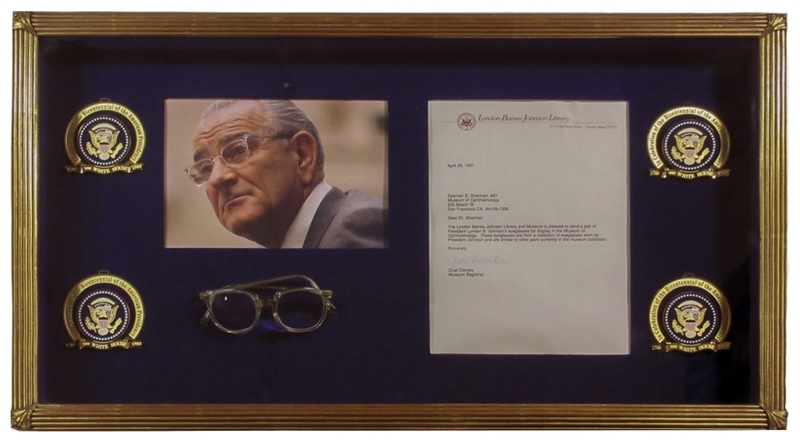 Framed in a shadowbox with a photograph of LBJ wearing a similar or the exact pair of bifocal glasses, and with a typed letter signed by Char Diercks, Museum Registrar of the ''Lyndon Baines Johnson Library''. Glasses have two damaged areas near the bridge, which have been repaired. Shadowbox frame measures 29.5'' x 16.5'' x 2.875'' deep, in near fine condition. (3) Eyeglasses worn by President Richard M. Nixon, who ''used the reading glasses...on a five-week around-the-world trip I made in 1985. They are perhaps the best-traveled glasses in your collection!'' Pair of reading glasses with black plastic frames have flared endpieces decorated with oblong metal cartouches, and measure 5.25'' wide from endpiece to endpiece. 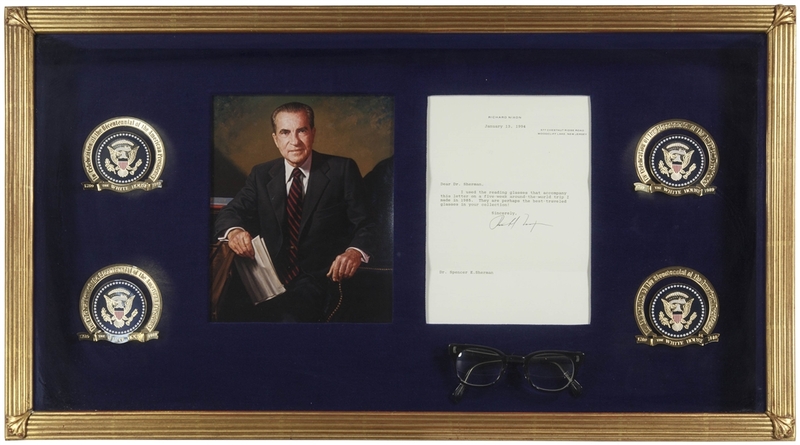 Framed with a letter signed ''Richard Nixon'' to Dr. Spencer Sherman, dated 13 January 1994 from Nixon's home in Woodcliff Lake, New Jersey, referencing the trip where Nixon wore these glasses. During this trip, Nixon traveled to China, Japan, South Korea, Hong Kong, Singapore, Malaysia, Thailand, Burma, Pakistan, Turkey, and Great Britain. Glasses are nicely framed in a shadowbox measuring 29.5'' x 16.5'' x 3.25'' deep, in near fine condition. 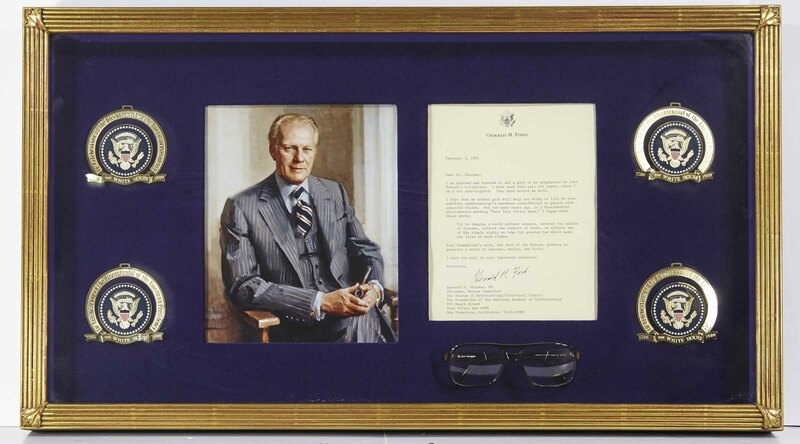 (4) President Gerald Ford owned and worn pair of eyeglasses, which he has used ''for years'', according to the accompanying letter. Pair of Terri Brogan eyeglasses, with Optyl amber colored plastic frames, measure 5.25'' from endpiece to endpiece. Framed in a shadowbox with a copy of a typed letter signed by Ford to Dr. Spencer Sherman, dated 3 February 1992, which reads in part, ''...I have used this pair for years, since I am a bit near-sighted. They have served me well...'' Shadowbox frame measures 29.5'' x 16.5'' x 2.75'' deep, in near fine condition. (5) President Jimmy Carter's owned and worn pair of ''his personal'' Foremost, U.S.A. browline eyeglasses. Glasses have thick plastic frame fading black to clear, and diamond shaped cartouches at endpieces, in size 5 1/2 measuring 5.25'' from endpiece to endpiece. 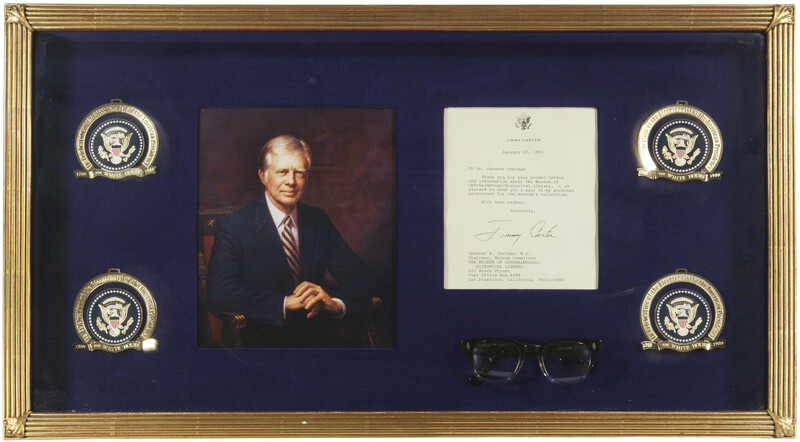 Framed in a shadowbox with a copy of Carter's letter dated 27 January 1992 reading, ''...I am pleased to send you a pair of my personal eyeglasses for the museum's collection...'' Shadowbox frame measures 29.5'' x 16.5'' x 2.875'' deep, in near fine condition with light surface wear. (6) Pair of the ''Great Communicator's'' eyeglasses, owned and worn by President Ronald Reagan. 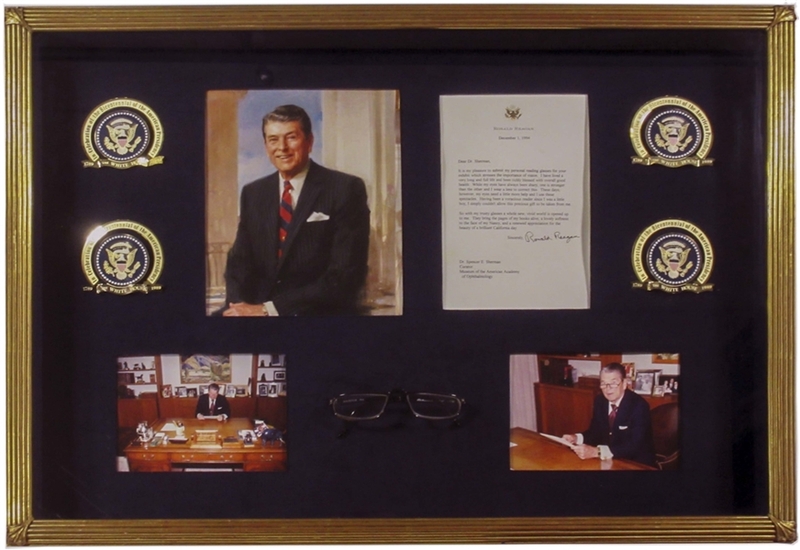 Glasses are framed with a lovely letter signed ''Ronald Reagan'' from 1 December 1994 on Reagan's stationery that reads in part, ''It is my pleasure to submit my personal reading glasses for your exhibit...I have lived a very long and full life and been richly blessed with overall good health. While my eyes have always been sharp...these days...my eyes need a little more help and I use these spectacles. Having been a voracious reader since I was a little boy, I simply couldn't allow this precious gift to be taken from me. / So with my trusty glasses a whole new, vivid world is opened up to me. They bring the pages of my books alive, a lovely softness to the face of my Nancy, and a renewed appreciation for the beauty of a brilliant California day.'' Lot also includes a photo of Reagan wearing a similar or the exact pair of eyeglasses, working in his Fox Plaza, Los Angeles office. Personal Optics Mauritius reading glasses with amber colored plastic frames measure 5.375'' from endpiece to endpiece. Shadowbox frame measures 29.5'' x 21.25'' x 3.25'' deep, in near fine condition. (7) Logo Paris eyeglasses owned and worn by President George H.W. 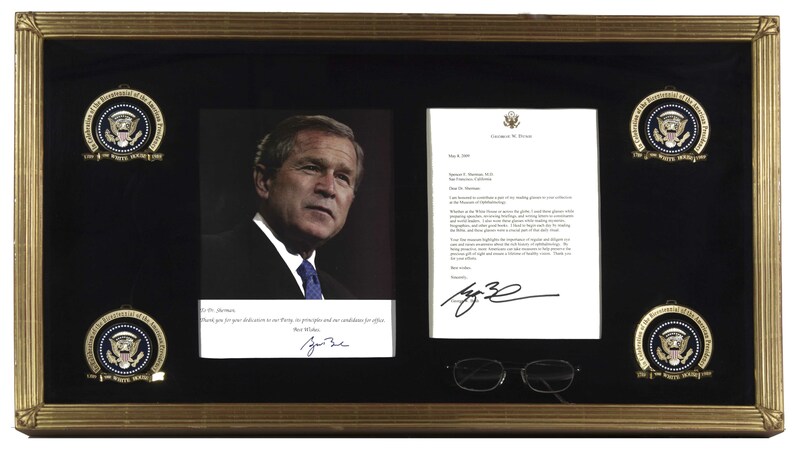 Bush, framed with an 8'' x 10'' photograph of Bush holding a similar or the exact pair of glasses. Metal finish glasses measure 5.25'' from endpiece to endpiece, with maker's name visible on left temple. In shadowbox frame with copy of letter from Bush and photo signed in autopen. Frame measures 29.5'' x 16.5'' x 2.875'' deep, in near fine condition. (8) President Bill Clinton's owned and worn pair of Italian-made Safilo Elasta eyeglasses, measuring 5.875'' from endpiece to endpiece. 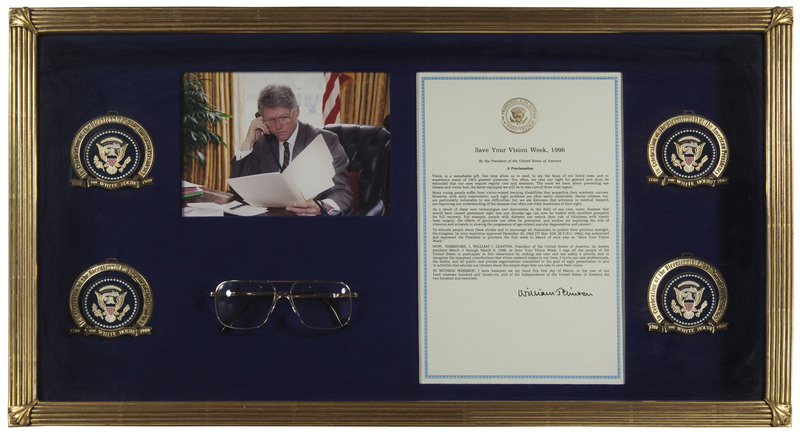 Framed with a photograph of Clinton at his desk in the Oval Office wearing a similar or the exact pair of glasses, and also with a proclamation signed in print ''Save Your Vision Week, 1996''. Shadowbox frame measures 29.75'' x 16.5'' x 3.125'' deep, in near fine condition. (9) Pair of Saville eyeglasses owned and worn by President George W. Bush. Well-worn pair of glasses have two flakes to the right lens, and both endpieces are even scarred with teethmarks by the 43rd President! 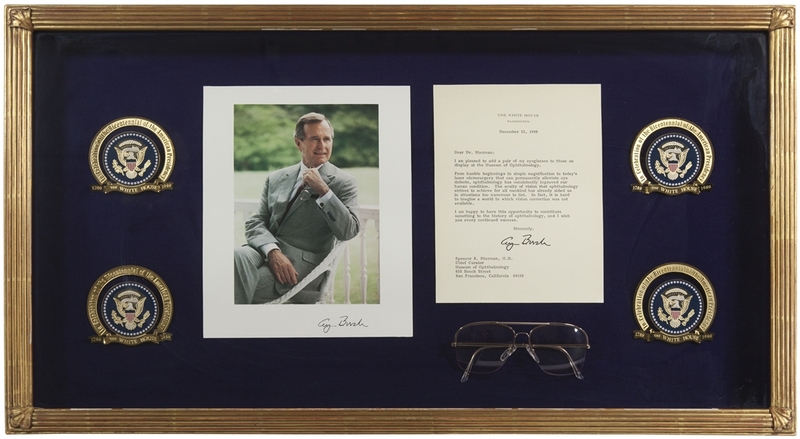 Metal finish glasses measure 5.5'' from endpiece to endpiece, framed with a letter signed by Bush on his Presidential letterhead on 8 May 2009, which reads in part, ''...Whether at the White House or across the globe, I used these glasses while preparing speeches, reviewing briefings, and writing letters to constituents and world leaders. I also wore these glasses while reading mysteries, biographies, and other good books. I liked to begin each day by reading the Bible, and these glasses were a crucial part of that daily ritual...'' Framed in a shadowbox measuring 29.5'' x 16.5'' x 2.75'' deep, in very good to near fine condition. Dr. Spencer Sherman is a known scholar in the field of ocular science and history, whose rare book and document archives formed the nucleus of the collection of the American Academy of Ophthalmology. He is the founder and curator of The Museum of Ophthalmology and Historical Library in San Francisco, from which these pieces are deaccessioned and consigned. An incredibly unique and personal collection of Presidential owned memorabilia.